Welcome to Greece These gentlemen caught my attention and I knew I just had to photograph them. 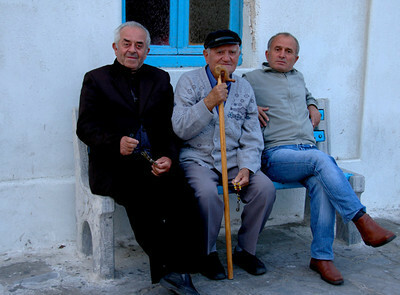 They are from Serbia and were visiting Mykonos. 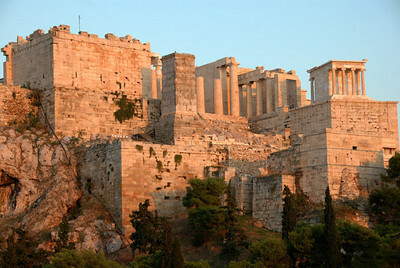 Athens - The Acropolis The temples on the "Sacred Rock" of Athens are considered the most important monuments in the Western world. 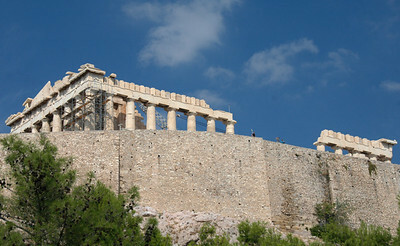 The great marble masterpieces were constructed during the late 5th-century BC reign of Perikles, the Golden Age of Athens. 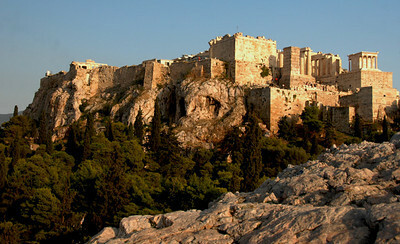 At the top of the rock is the Propylaia, the grand entrance through which all visitors passed to reach the summit temples. 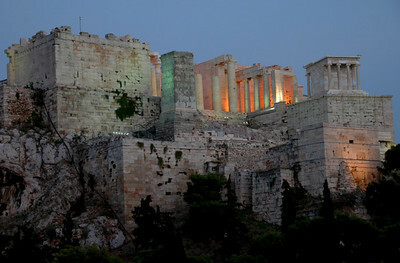 To the right is the Temple of Athena Nike ("Victory"). 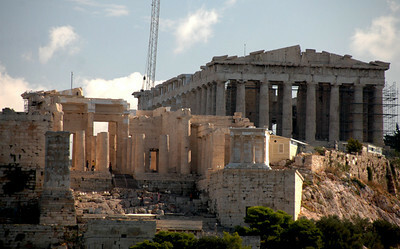 Athens - The Parthenon The Parthenon is a magnificent "Temple to the Virgin" goddess Athena, who was represented inside by a giant gold and ivory sculpture. 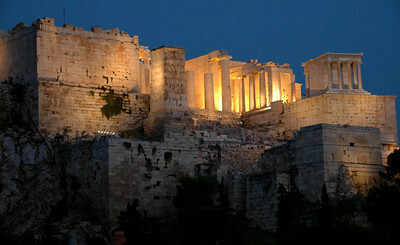 The Parthenon was constructed between 447-432 BC. Athens - The Parthenon Pieces of broken columns. 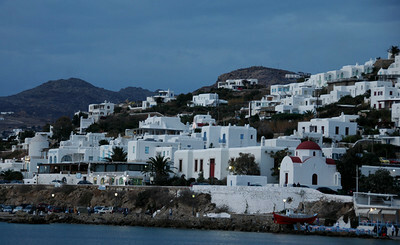 Mykonos Chora, the islands capital, owes its special character to the whitewashed, cubic shaped houses trimmed in every shade of blue, lining its narrow cobblestone streets. 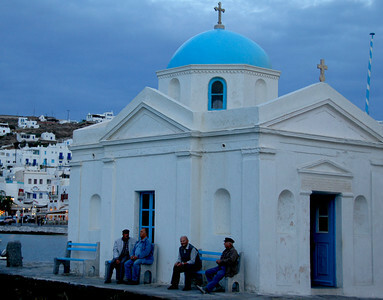 Mykonos A local church - one of many local gathering places. Santorini - Town of Oia The town of Oia is perched at the summit of the caldera, on the northern tip of the island. This picturesque fishing village was devastated by an earthquake in 1956 and has been completely rebuilt. 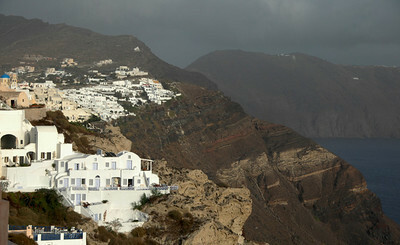 Oia is comprised of 2 streets. 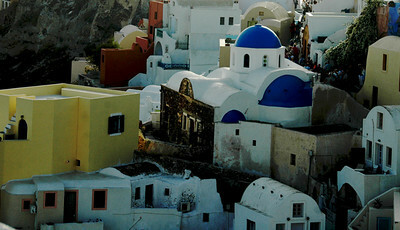 Buildings and tree trunks are painted white every year and stand out against the backdrop of rust color layers of rock, earth and volcanic ash. 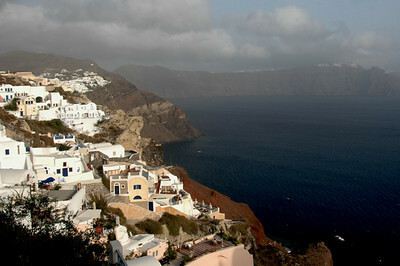 Santorini - Town of Oia Oia has preserved most of its character and its peacefulness. 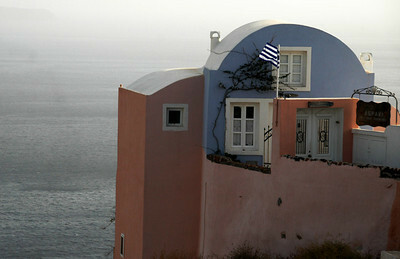 Its white houses, built virtually on top of each other, appear to hang on to the cliff; some of them are even built into it. Santorini - Town of Oia Another view of the town built on top of the island. Santorini - Town of Oia What a spectacular view ... but an awfully long way down! 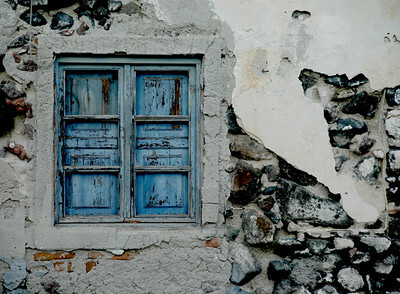 Santorini - Town of Oia Old windows. 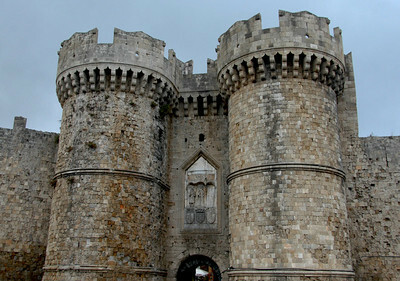 Rhodes - The Walled City Rhodes is the largest of the Dodecanese and the fourth largest Greek island. 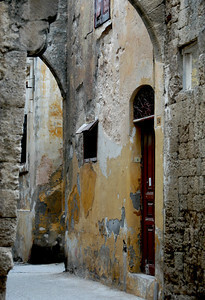 The old buildings of the walled city were erected by the Knights of St. John. Olympia - Olympic Stadium Home of the original Olympic Games. Spectators would sit on either side of the stadium to watch the games. 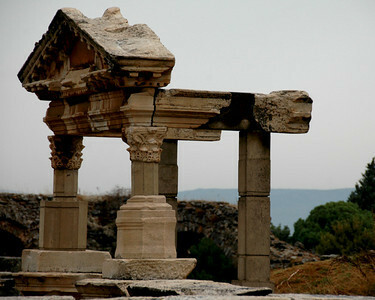 Turkey - Ancient City of Epheses "Fountain of Trajan" Ephesus was ruled by the Lydian King, Kreisos, in the mid 6BC. 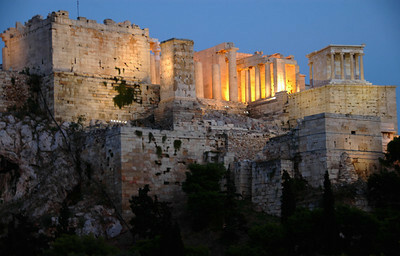 Later, Ephesus was dominated by Persians and then Alexander the Great. 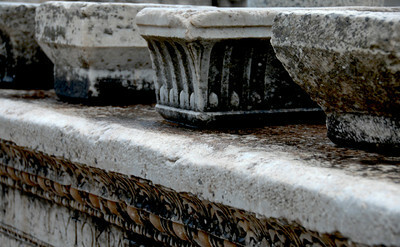 This fountain was constructed for the honor of Emperor Trajan. The pool of the fountain was surrounded by columns and statues. These statues were Dionysus. Satyr, Aphrodite and the family of the Emperor. 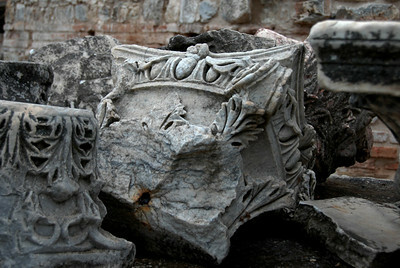 Turkey - Ancient city of Epheses Broken pieces of columns. Turkey - Ancient city of Epheses "Temple of Hadrian" The temple is one of the best preserved and most beautiful structures on Curetes Street. It was built before 138 AD by P. Quintilius and was dedicated to the Emperor Hadrian, who came to visit the city from Athens in 128 AD. 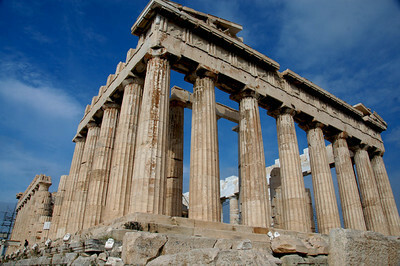 The facade of the temple had four Corinthian columns supporting a curved arch, in the middle of which contains a relief of Tyche, goddess of victory. The side columns are square. 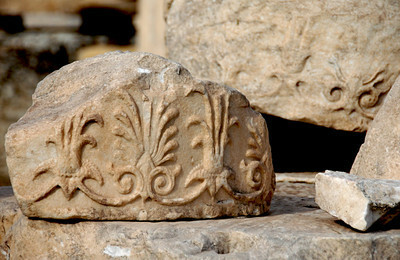 Turkey - Ancient city of Epheses Pieces from columns or pedestals. 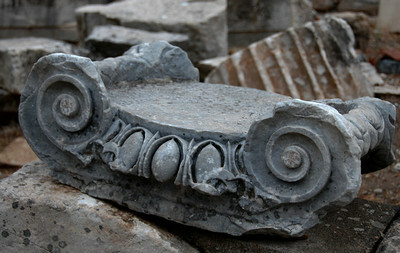 Turkey - Ancient city of Epheses More broken pieces from columns. 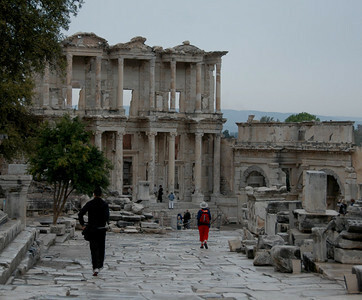 Turkey - Ancient city of Epheses "Celsus Library" The library was built in 117 AD as a monumental tomb for Gaius Julius Celsus Polemaeanus, the governor of the province of Asia, from his son Galius Julius Aquila. The grave of Celsus was beneath the ground floor, across the entrance and there was a statue of Athena over it because Athena was the goddess of wisdom. 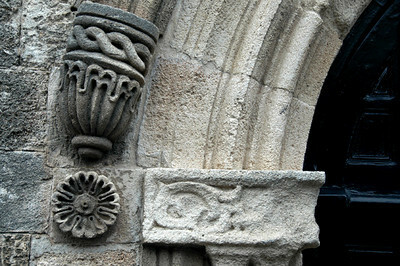 Scrolls of manuscripts were kept in cupboards in niches on the walls. There were double walls behind the bookcases to prevent them from the extremes of temperature and humidity. The capacity of the library was more than 12,000 scrolls. 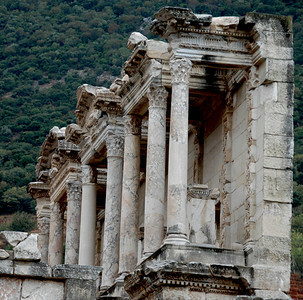 It was the third richest library in ancient times after the Alexandra and Pergamum. The facade of the library has two stories, with Corinthian style columns on the ground floor and three entrances to the building. There was also an auditorium which was for lectures or presentations. Turkey - Ancient city of Epheses Side view of the Celsus Library. Turkey - Ancient city of Epheses "The Great Theatre" The theatre was first constructed in the Hellenistic Period, the third century BC during the reign of Lysimachos, but then during the Roman Period it was enlarged and formed its current style that is seen today. 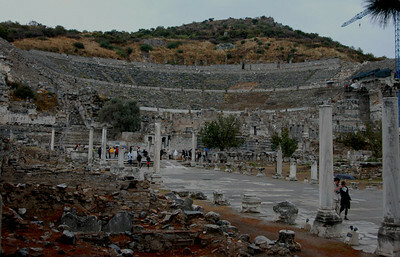 It is the largest in Anatolia and has the capacity of 25,000 seats. The cavea has sixty-six rows of seats, divided by two diazoma (walkway between seats) into three horizontal sections. There are three sections of seats. 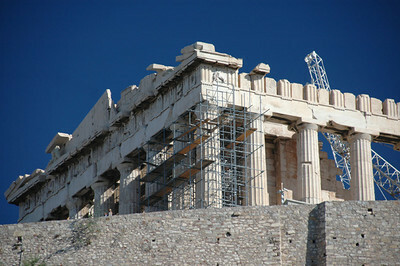 In the lower section, Marble pieces, used for restoration, and the Emperor's Box were found. The seats with backs, made of marble, were reserved for important people. 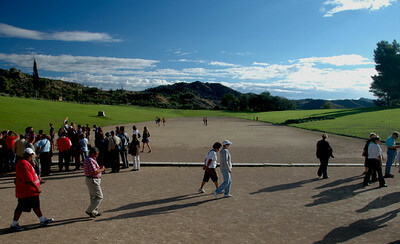 The audience entered from the upper cavea. 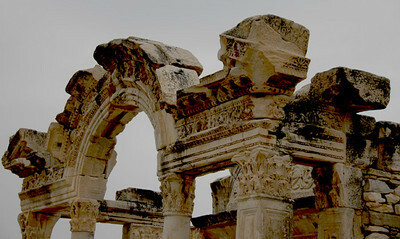 The facade facing the audience was ornamented with reliefs, columns with niches, windows and statues. There are five doors opening to the orchestra area, the middle one of which is wider than the rest. This enhanced the appearance of the stage, giving it a bigger, monumental look. 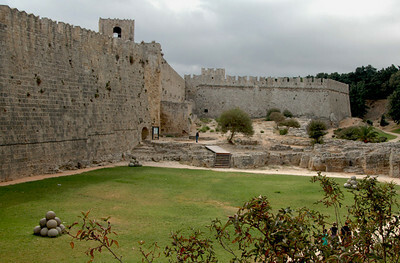 The theatre was used not only for concerts and plays, but also for religious, political and philosophical discussions and for gladiator and animal fights. 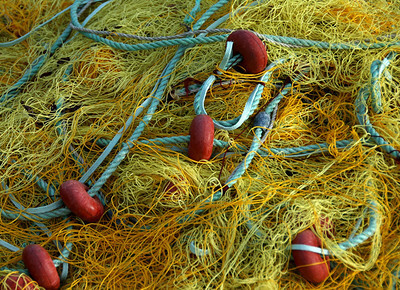 Herkalion - Crete Fishing nets along the harbor of Herkalion.